You are currently browsing the tag archive for the ‘Canary Island Palms’ tag. A couple of weeks ago I was in Campsie & came across an incredible streetscape. The street was named Eighth Avenue & is fortunate to have large verges, as well as a large median island. 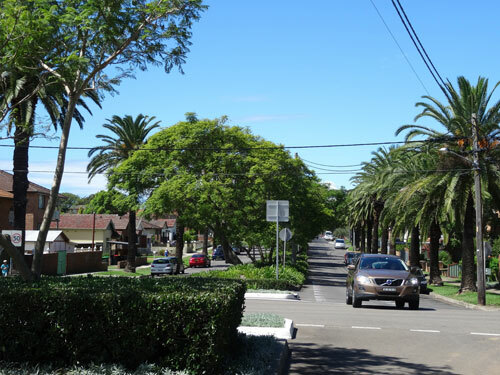 The section I walked had eleven Canary Island palms lining the avenue on each side with twelve Jacarandas growing along the middle of the traffic island. Planted under the Jacarandas were thousands of Agapanthus plants. I can just imagine how these look in mid-spring & early summer when both the Jacarandas & Agapanthus are in flower. My bet is that it looks stunning. Eighth Avenue is much longer than the section I photographed. The design elements of Canary Island palms, the Jacarandas & Agapanthus continues down its length as far as I could tell. Not all the palms are the same size, so it appears that over time any that died have been replaced to keep the continuity. 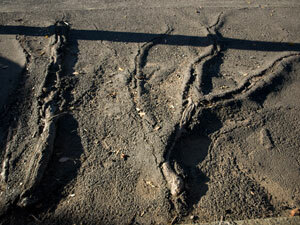 Also of interest is that aerial bundled cabling has been used to protect the trees. This will lessen the need for pruning by the power company & is money well spent in my opinion. 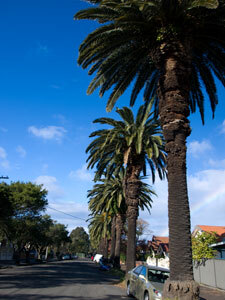 I was pleased to read that all the palm trees are heritage-listed & under the care of Canterbury Council. The palms had been pruned of dead fronds, but in a way that did not remove most of the canopy. The pruning was not noticeable for most of the trees. Canterbury Council’s local history Wiki ‘Canterbury Commons’ says, “The Harcourt model suburb, formerly Mary Redman’s farm, was laid out by W.E.H. Phillips in 1889. It had wide avenues ornamented by trees and statuary. The numbered avenues north-west of the railway station formed this estate, which was much admired as an ideal subdivision for the working man to build a house in the ‘peaceful repose” of the country.” I wouldn’t be surprised to learn that the palms were planted shortly after the establishment of this subdivision. I love it when I come across beautiful streetscapes, especially when they contain heritage trees. Eighth Avenue is a treasure & obviously respected by the locals, as there was no litter, no graffiti tagging & no noticeable removal of Agapanthus plants. I hope I remember to go & have a look next October-November when the street should be ablaze in blue/purple. 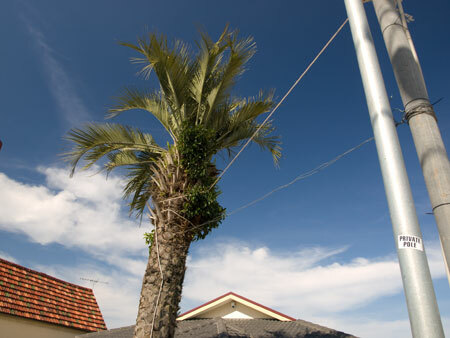 I drove through Marrickville last week & saw a new Canary Island Palm. It had been installed in the front garden of Lee’s Learning Centre, a new building & business on Livingstone Road. 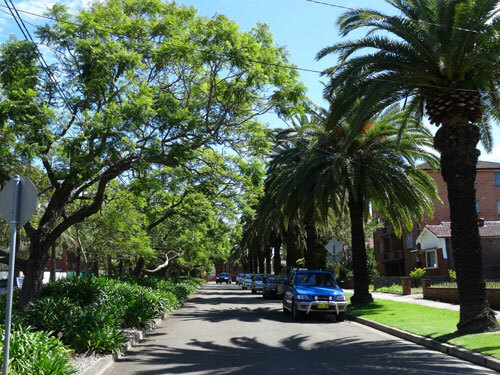 Marrickville Park with its resplendent Canary Island Palms & the row of these same trees classified by Council as heritage in nearby Graham Avenue off Livingstone Road tie this tree & property in with the local area. 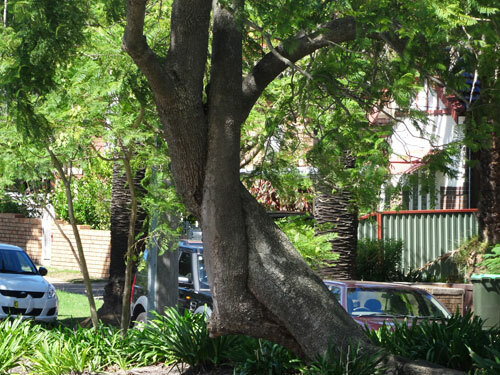 The tree trunk is around 8-metres high & at an average of $1,500 per metre of trunk, plus GST, the owners have added something very nice that benefits the local community & streetscape. This tree has had fronds removed for ease of transport, but new ones will grow in time. 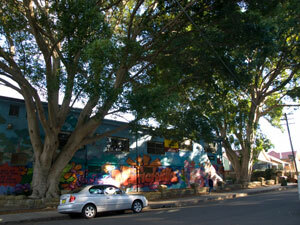 Soon this tree will be another local landmark adding to some other spectacular trees in Livingstone Road. It certainly was a smart move for Lee’s Learning Centre in terms of being easily findable. People will refer to the business as the place ‘with the palm in the front garden,’ as it is common to use trees to describe a location. It’s so good that this tree was given another life & moved to this site. Canary Island Palms can live for 160-200 years so their investment was a wise one. 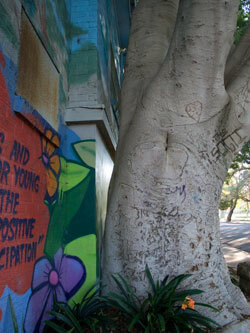 In February 2010 I wrote about the resplendent Morton Bay Fig at St Stephen’s Church in Newtown for Festival of the Trees. See https://savingourtrees.wordpress.com/2010/02/24/st-stephens-fig/ With this post, I aim to describe the cemetery as I have experienced it. To separate the graveyard & the trees is almost impossible as they intermingle & both are quite beautiful. Once you walk past the massive Morton Bay Fig planted in 1848 & the 2 large clumps of Giant Bamboo, also planted more than a century ago, you follow the dirt road that takes you to the heritage protected Gothic Revivalist St Stephen’s Church & immediately into the cemetery. The graveyard itself starts within metres of the entrance on both sides of the dirt road. The current cemetery is about 4 acres (1.6 hectares) & is bordered by a high sandstone wall. The land, 4 kms from Sydney’s CBD, purchased by a group of businessmen in 1845, was originally 12.5 acres (4.8 hectares). 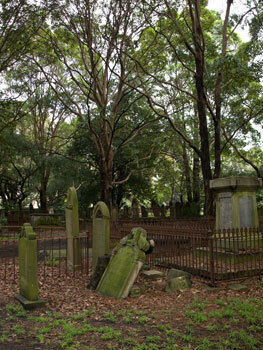 It was the main cemetery for Sydney until it closed in 1867 because it was full. Even so, a few people were buried here up to the 1940s. All up, about 18,000 people were buried here, though the true numbers are not known because many of the graves hold multiple people, all buried on top of each other. A significant number of the famous are buried here. In 1948 Marrickville Council reclaimed ¾ of the cemetery land to create a public park & Camperdown Memorial Rest Park opened in 1951. The headstones and other fixtures were brought inside the cemetery wall & I guess the thousands of interred are still under the park while the dog walkers & others play overhead. Rather a gruesome thought, though I know others who question why I think like this. The tombstones from outside the new boundary were removed & placed inside & against the sandstone perimeter wall & fixed in place with steel nails. Unfortunately, the nails have rusted over time & split many of the headstones. 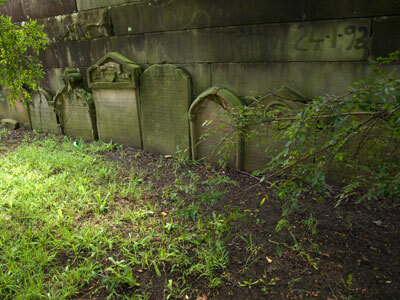 Most of the graves & headstones are made of Sydney sandstone & have seriously weathered over the years. The graves surround the church, then spread out through the cemetery. I have not been on one of the regular guided tours, so I do not know much about the individuals who were buried here. Directly behind the church is an impressive grave in the style of a boat. My favourite tombstone is a tree stump made of cement. Over time it has weathered & appears real until you look closely. The cemetery is also special because of the trees. There are Brush Boxes (Lophostemon confertus) planted in the 1960s, Blackwoods (Acacia melanoxylon), a Lemon Scented Gum (Corymbia citriodora), a Port Jackson Cypress Pine (Callitris rhomboidea), 2 African Olive trees (Olea africana), a number of Melaleucas, a grove of Chinese Elms (Ulmus parvifolia), Canary Island Palms (Phoenix canariensis), a Morton Bay Fig (Ficus macrophylla), a few Birch trees & a number of Camphor Laurel trees (Cinnamomum camphora). There are also 2 clumps of Giant Bamboo. If I were to take you on a tour, we would walk down the dirt road passing many graves & a row of Canary Island Palms planted in the 1930s. There is a circular road behind St Stephen’s Church & many of the gravestones in this area are impressive. From here we would walk into the small area beside the church on the other side. It is somewhat off the path, but it is well worth it because of the enormous Oak that spreads its boughs here. The last time we went it had been raining heavily & the ground was very boggy, which I think would discourage people from going in this direction. In this area the gravestones are sparser, though I would guess there are people buried in unmarked graves. The Oak is magnificent & would be one of the trees that were planted in 1848. The Oak tree spills out claiming a lot of space & I can easily imagine the kids playing on it after church a century ago. A few metres away a big tree has recently been chopped down. Judging by the side of the stump, I imagine this tree also filled the space now open to the sky. Interestingly, the stump is one of many which is directly next to a grave & over time it has dislodged part of the stone. I would guess there was a tradition of planting a tree where a loved one was buried. The cemetery did have many Peace roses, but Marrickville Council removed them because it was felt they required too much care. I found one old rose bush planted in a grave, so perhaps it is a remanent of the original roses. Moving away from this area & rejoining the dirt path that meanders around the left side of the cemetery following the sandstone fence, you pass very old Brush Box & Camphor Laurel trees. 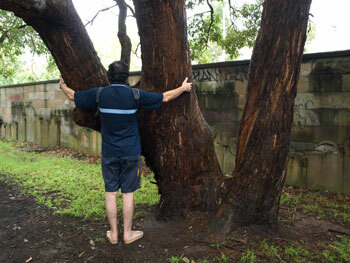 Their trunks are massive & they have been left to grow naturally with minimal pruning. A special site is on your left where those from the shipwrecked Dunbar & the Catherine Adamson in 1857 are buried. I know it is important because these graves are painted white & are well looked after. The dirt path becomes a track & takes you to & along the back wall of the cemetery. Tombstone after tombstone are lined up against the perimeter wall. Some are detailed & very beautiful while others are simple affairs. The trees in this area are different. They too are tall, but their branches sweep just above the ground & in some cases require you to dodge & walk around them. Some of the graves here are different as well, being just headstones & you have to assess where the grave would be if you don’t want to tread on them. This part of the cemetery has remanent Kangaroo grass (Themeda triandra) left over from when the whole area to Botany Bay was covered with this species of grass. It’s nice to look at & I can easily imagine following the walking trail to the sea over miles of this soft grass that would have caught the light & changed colour throughout the day. To your right is the centre of the cemetery & my favourite area. It has no path, is dense with tall trees & you cannot see the church. Apart from the odd gravestone, you could be anywhere. The grass is long & many of the graves are overgrown. There is a birch wood covering a few metres that have sprung up naturally after the initial trees were planted. There is also some Wattle, a very large a Port Jackson Cypress Pine, more Oak trees planted in 1848 & a grove of Chinese Elms. In the middle is an old Oak stump that stands about 6 feet high with a natural hollow that ascends to the top. 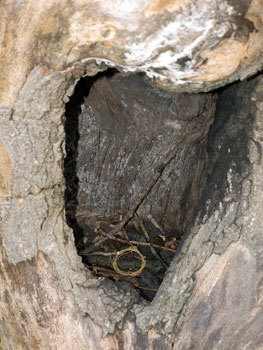 Here I found a piece of hand-made jewellery that has been carefully placed inside. It made me think that I had come across some sort of wishing ritual, so apart from taking a photo, I did not touch it. One branch from this tree has been left on the ground. It had the most amazing pattern & to me looked almost like rivers taken from space. Interesting that pictures of earth from space can look similar to what we can see in nature & even the same as inside the human body. The patterns repeat again & again. I hope the church authorities leave this stump as it is very beautiful. Leaving the centre of the cemetery, you return to the path, which widens & takes you back to St Stephen’s Church. Here there are many other tall & old trees, mostly Brush Box. The most filigree tomb is right in the front left-hand corner behind the Giant Bamboo. Here 4 figures act as columns for a roof structure. Each figure looks different & holds something different. We did not notice the bees that started to gather & had to run away because these bees were quite territorial. There are at least 2 hives situated at the back of the Lodge located a few metres away. 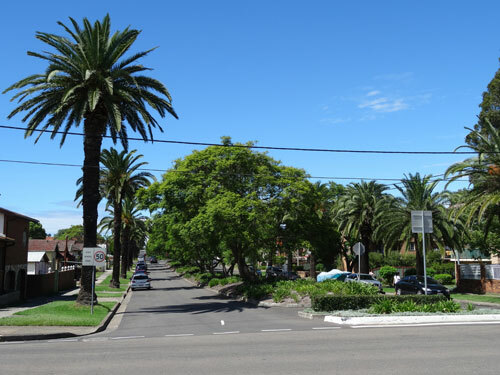 Once you pass the Giant Bamboo & the massive Morton Bay Fig, you return to the front gate & are in the heart of busy Newtown with it’s tiny terraces & narrow streets. 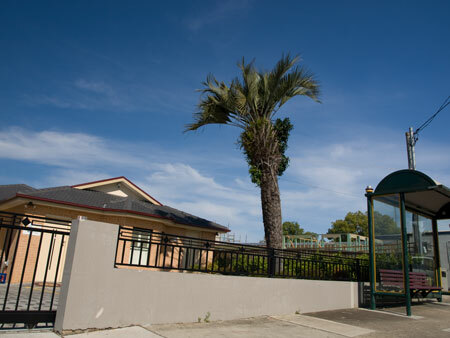 If you follow the perimeter fence to your left, you come to Camperdown Memorial Rest Park where a few of the original Brush Box trees can be seen at the edge of the park. This much-used park is where the cemetery was originally, so remember to be quiet. There are people sleeping under your feet.